April 12 – England defender Danny Rose wants football’s governing bodies to “sit down and discuss how to eradicate” racism at the end of the season. Last week, the Tottenham fullback said he “can’t wait to see the back of football” following the latest incident of racist chanting towards him during a Euro 2020 qualifier in Montenegro. 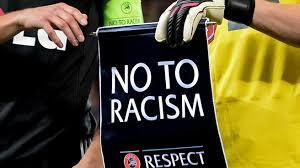 Juventus’ 19-year-old Italian forward Moise Kean suffered racist abuse from the stands during a match at Cagliari on 2 April but racism has also started to creep back into English domestic games – even at top-flight level. Watford captain Troy Deeney is alleged to have suffered discrimination on social media while Manchester City’s Sterling was allegedly abused at Chelsea in December. “I hope that once the season’s finished people can sit down and discuss how to eradicate these unfortunate things that are happening now in football,” said Rose.